CAPE TOWN, South Africa (CNS) — In helping abandoned elderly people in Tanzanian villages, young people have learned to care for themselves, too, said a nun who oversees the project that she began with Catholic friends in the U.S.
Sixteen people ages 16-30 build beds and repair houses among other caregiving activities for the 69 elderly people served by the Village Angels of Tanzania project in two villages in the rural Ngara District in northwestern Tanzania. 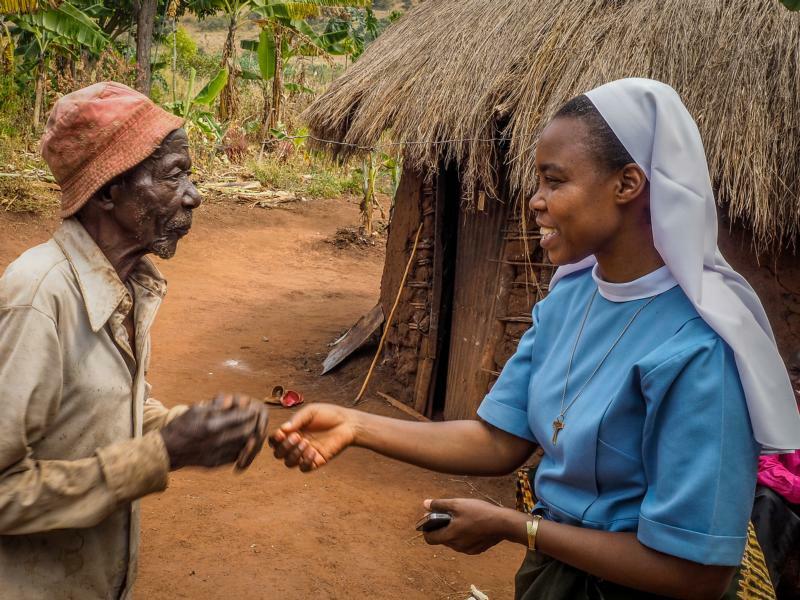 “For some elderly people, this is the first time in their lives that they have slept in a bed,” said Sister Dativa Mukebita, a Franciscan Sister of St. Bernadette who set up the project in her hometown two years ago, on her return from studying in the U.S.
Ngara District, a remote area in this East African country that borders on Rwanda, was host to hundreds of thousands of refugees who fled Rwanda’s 1994 genocide and suffered huge environmental and social damage when the camps were disbanded, Sister Mukebita said in a July 12 telephone interview from the town of Ngara. With a tradition of families caring for their own, Tanzania has no nursing homes or pensions to support elderly citizens, and many find themselves abandoned and alone, she said. There is a “missing middle-generation” in Ngara District caused by people moving away in search of work opportunities as well as deaths from AIDS-related illnesses, she said. At the same time, the area is home to young people with little education, few skills and “no hope of finding a job,” Sister Mukebita said. The youths receive a stipend for providing support and companionship to the elderly. They plant and harvest crops that they take to the elderly and sell the surplus at local markets to boost the project’s funds. As part of the project, the youth are taught handicrafts, including basket weaving, as well as skills such as sewing and beekeeping. They have built 70 beds and taken them to the elderly, along with mattresses, pillows and sheets. This elderly in the region “no longer live in heartbreaking isolation and poverty,” Sister Mukebita said. The story of an old woman who died after lying where she had fallen for three days without food or water led to the determination of Sister Mukebita, a New Jersey family and a retired priest to get this project up and running. While studying in New Jersey, Sister Mukebita met Johanna Burani in a computer class. Sister Mukebita planned and prayed with Burani and Burani’s husband and sister, as well as Father Martin Rauscher, retired pastor of Assumption Parish, Morristown, New Jersey. The result was the establishment of the Village Angels as a nonprofit charitable organization with a board of trustees. After garage sales, cake drives and other fundraising efforts, when Sister Mukebita returned to Tanzania there was enough money to start sending young people on weekly visits to the elderly with food and other basic supplies. “As well as benefiting economically from the project, the young people also have grown dramatically in self-esteem,” Sister Mukebita said. There also have been opportunities for advancement. For instance, Sister Mukebita said Faustine Kisuka, 30, has become a supervisor and is learning English. Despite having only elementary school education, Kisuka “is outstanding in his ability to interact with people and to take responsibility,” she said. What a heart-warming story! Thank you to Sr. Dativa, Fr. Martin Rauscher, Johanna and Sergio Burani and the youth who have made this project a success. May God bless you and continue to keep you in His care.